Naples is a true shopping paradise: Clothes and shoes are relatively inexpensive, and fashion always follows the most current trends. Also lovers of antiques, cribs and handicraft will find a lot of beautiful shops. 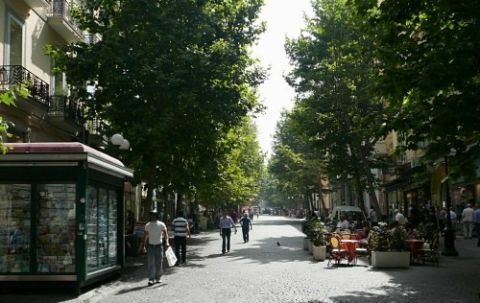 Discover the most exiting shopping streets in Naples! 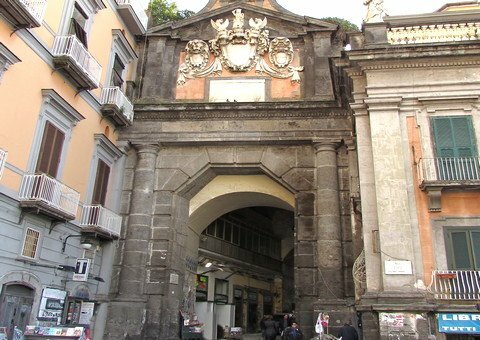 In Via Toledo (also with the old name “Via Roma” called), one of the longest shopping street in Naples, you find numerous boutiques, a department store, and branches of big chains. 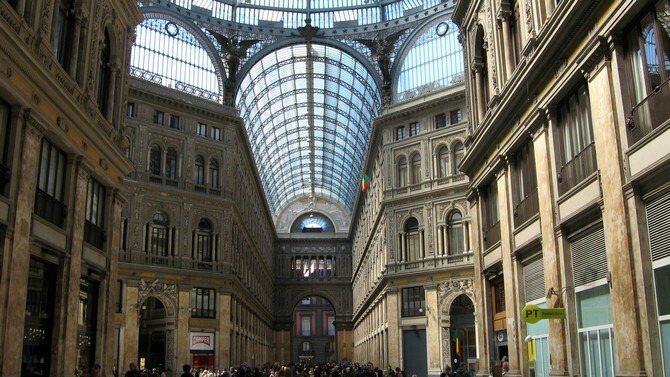 Located in this street, which is for the most part a pedestrian area, is also the Galleria Umberto I, which impresses by its neoclassical architecture. At the Piazza Trieste e Trento, which is the end of the pedestrian area of the shopping street, you find the elegant Café Gambrinus in the Belle Èpoque style. It represents a part of Naples’ s history, and when you look at the long counter with dolci (cake and pastries), it will be hard to choose: You should definitely try a sfogliatella! Diagonally opposite the Cafè extends the big Piazza Plebiscito with the Palazzo Reale. If you haven’t shopped enough yet, you turn before Café Gambrinus into the exclusive Via Chiaia. Here, you find mostly brand boutiques, but also antiques- and art dealers. 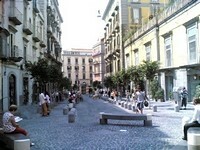 The price level continues to increase in the Via dei Mille, the most exclusive street in Naples. How to reach Via Toledo: Take the Metro line 1 to Piazza Dante, and continue on foot to Piazza Plebiscito (longer tour). The Metro station in the Via Toledo hasn’t been finished yet. From the Vomero, you can reach Via Toledo by the funicular railway “Funicolare Centrale”. The station Piazza Trieste e Trento is across the Galeria Umberto. How to reach Via Chiaia and Via dei Mille: Take the Metro line 2 to Piazza Amedeo. Continue on foot to Via dei Mille. From Vomero, you can take the “Funiculare Chiaia” until you arrived at the last station (Via del parco Margherita). If, on the other hand, you are interested in antiques and craftwork, you should take a walk through the historic city. 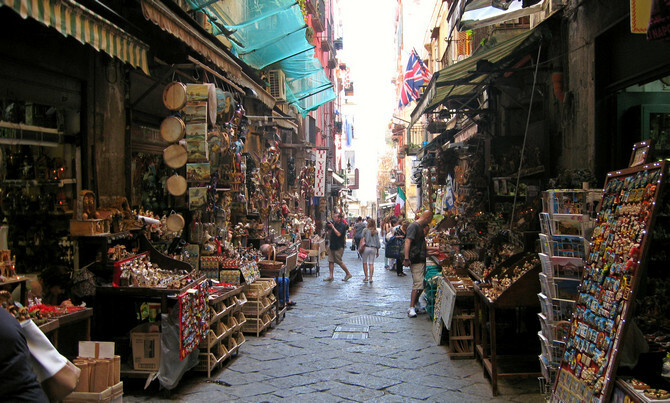 In the Via San Gregorio Armeno, the street of the nativity scene makers, they produce wonderful nativity figurines, and in the alleyways of the historic city, you can find many antiques dealers. How to get there: Take the Metro line 1 to Piazza Dante and continue on foot. In the quarter of Vomero, which is situated on a hill, you can go shopping in elegant boutiques and shoe stores in Via Luca Giordano or on the smaller pedestrian area, Via Scarlatti. 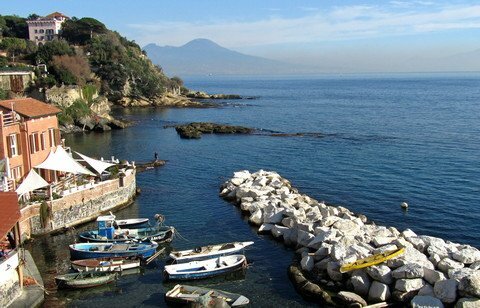 Nearby is the Villa Floridiana Park, where you can rest while you enjoy the beautiful views. 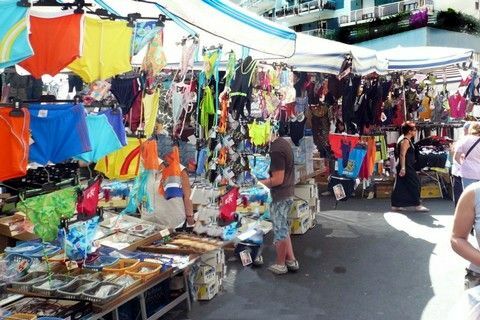 A visit of the smaller market, Antignano, in the mornings is very interesting. How to get there: Take the Metro line 1 to Piazza Vanvitelli. As an alternative, you can take the “Funicolare Centrale” from Via Toledo to the last station.